My family wasn’t good at keeping albums. 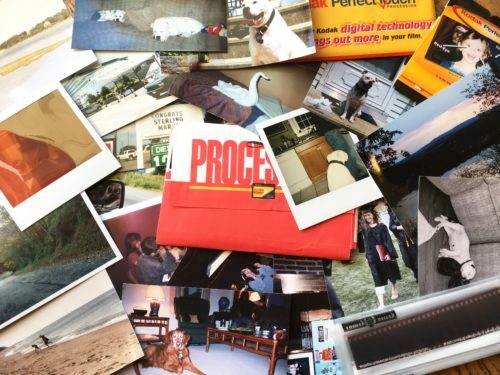 Over the years, our collection of old photos piled up in a cardboard Avon box that lived in the attic. Every so often, the bulging box would make an appearance and my mom, sister and I would paw through the printed pics. We’d smile and reminisce as we passed around images of days gone by. Pictures from my parents’ wedding were in that box too. They were protected by a brown paper bag at the bottom of the pile. Sometimes we’d bring those into the light as well. For me, those photos were simply a record of my life: my infancy, my toys, my parents, my sister, our home, our pets and our family vacations. And since my parents had such a friendly divorce, I wasn’t pained by the nostalgia that came with the imagery. Years later, I realize again how lucky I was. In many families, old photos are hidden, defaced or destroyed as reminders and reference to all things pre-divorce are forbidden. Now, I get it: pictures can be painful. Second, focus on healing. Hating your ex might help you feel better in the short-term, but it’s not healthy. Invest in rebuilding your life and maintaining a functional (if necessary) relationship with your ex (and the previous version of yourself who existed in that partnership). Aim to accept the end of the relationship and appreciate the positive things that came from it. Realize that chapter of your life made you who you are. Third, thin the file. When you’re ready, revisit your stash and move some (not all!) to the trash. If it’s appropriate, you could involve your children for this step. They can help determine what’s worthy, and some images could be transferred to their possession. Finally, move forward. Congratulations! Now you’re ready to put the pictures away again, and this time you can do so with a greater sense of dignity. You’ve faced the bittersweet past and survived. You have nothing to hide and nothing to hide from. You’re simply turning a page in your personal story. Prepare to fill the next chapter with new pictures. Posted in divorce, family and tagged breakup, divorce, old photos, photos, pictures.